Rescued Chimpanzees. Incredible fresh food. Sunset Yoga. An evening under the canopy. More Yoga. Friends. This is the weekend you’ve been waiting for. 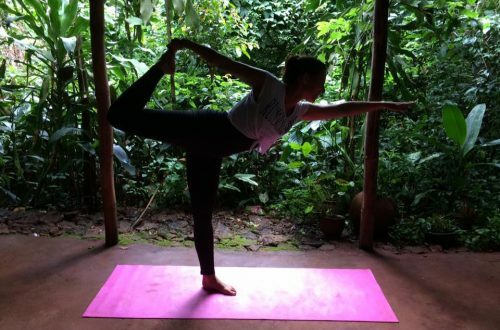 Our most popular event, yoga retreats happen once monthly in Tacugama’s eco-lodges. We invite you to join us for an intimate weekend of 3 yoga classes on our forest platform, all meals provided, a sanctuary tour and a night in our eco-lodges. Reserve early to secure a spot! Package prices are based on full occupancy assuming shared accommodation of the lodges. All levels are welcome: both the experienced yogi and the brand new beginner (we’ll work to suit your level). We will focus on heart-opening poses, including back-bending, introduction to simple mantras and most importantly, yoga-play in a weekend of rejuvenating and refreshing the body and mind. Bring a smile, your own yoga mat and some water, as well as any personal items you may need for the overnight stay (insect repellent, toiletries, change of clothes, etc). Drinks and water can also be purchased at our shop, as they are not included in the weekend package. All the sleeping quarters are outfitted with mosquito nets. In the dry season, classes are a maximum of 15-20 people as we have a large outdoor forest platform. In the rainy season, yoga typically occurs in our fireplace room, which is a round semi-exposed hut that fits a maximum of 10 people comfortably. Classes are very personalized allowing everyone to gain the maximum benefit from the instructor. Being in a forest setting, we do have some critters roaming around – but don’t fret! A light dose of insect repellent and long clothing if that suits you, will keep you very comfortable on our yoga platform. Please e-mail us at info@tacugama.com and let us know the preference for the lodge you’d like to book and any dietary preferences you might have. For couples or groups, it is best to book together so we can reserve an entire lodge for you. For individuals, while we do our best, lodge preferences cannot be guaranteed depending on availability for the weekend. Please expect to share accommodations.